Background: Stenosis at the duodeno-ileal anastomosis has been observed after LBPD-DS, and it can be managed surgically or endoscopically with balloon dilatation. We reviewed the incidence of duodeno-ileal stenosis (DIS) in our cohort of patients who had LBPD-DS and evaluated the role of therapeutic endoscopy in our treatment algorithm. Methods: We queried our prospectively maintained bariatric surgery clinical database to identify a consecutive series of all patients who underwent laparoscopic BPD-DS procedure at our institution. Data was extracted from the electronic database and the patients’ paper medical records. An electronic spreadsheet was used to analyze the data. Continuous variables are reported as means±s.e. Results: Between Nov 2006 and Dec 2010, 315 patients (264 F: 51 M) underwent a complete LBPD-DS using a circular stapler to fashion an end-to-side duodeno-ileal anastomosis. Video of the technique is available. Females represent 83.8% of our sample. The mean age at the time of surgery is 40 years (range: 16 to 67 years). The mean preoperative BMI is 47.7 ± 2.7 Kg/m2 (range: 34.1 – 83.2 Kg/m2). Gastroscopy was used to evaluate symptomatic postoperative patients, and the incidence of duodeno-ileal stenosis was 12% (37 patients). The majority of stenosis (79%) occurred in the first three months after surgery. Endoscopic balloon dilatation was employed as the treatment of choice for DIS, and it proved helpful in 76% (28/37) of cases. Multiple dilatation sessions were needed in 57% (22/37) of cases. Dilatation related perforation occurred in 7 patients. Patients requiring multiple dilatation sessions were not at higher risk of perforation than those having had only one session, RR=1.02 and 95%CI [0.26,3.91]. Surgery to definitively resolve persistent severe stenosis or treat perforation post dilatation was needed in 24% (9/37) of cases. Endoscopic or surgical treatment for stenosis was associated with no mortality. 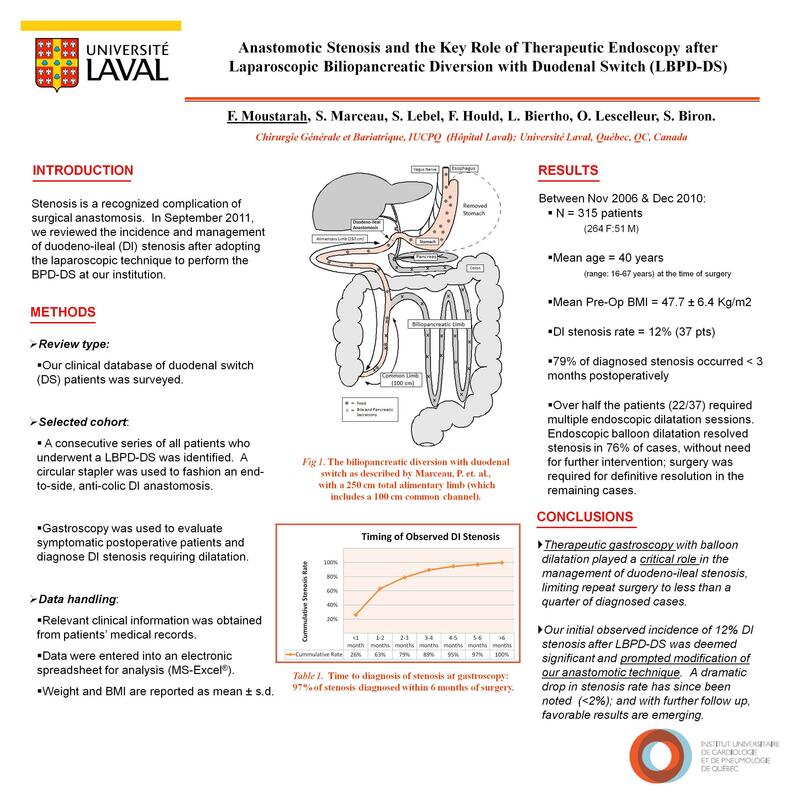 Conclusion: Therapeutic gastroscopy with balloon dilatation played a critical role in the management of anastomotic duodeno-ileal stenosis found in patients presenting with upper gastrointestinal symptoms after a primary LBPD-DS. It limited surgical intervention for stenosis to less than a quarter of patients in our cohort. In addition, our observed rate of stenosis prompted innovation and refinement of our surgical technique with very favorable results emerging for presentation.